Tomorrow, a group of women and I will descend on the glory that is the Green Valley Book Fair. The Fair is a veritable emporium of WAREHOUSES full of books. As a book lover, this trip is a little of heaven (and hell since I can’t buy everything). . . but as a writer, it also has a couple of lessons to teach me, as do all library book sales, thrift store bookshelves, and book giveaway piles. 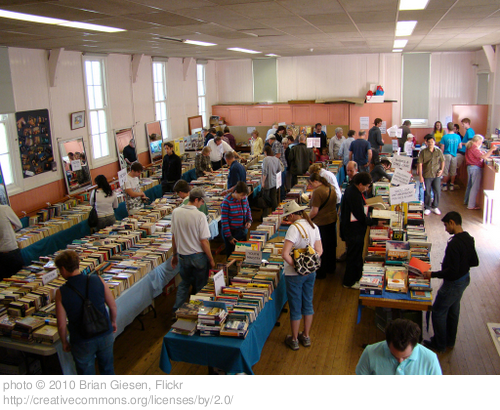 First, most of the books there are bargain/remaindered books – books that didn’t sell well on their first printing or as hardcovers and are now marked down to low, low prices. It makes a little sad to see all these books this way. A friend once told me he always wanted to buy bargain books to save them from this fate. I completely agree. These books make me want to write and market my writing really well so my books don’t end up in the remainder piles. . . they just remind me just a bit of abandoned stuffed animals – forlorn and lonely. Secondly, the fact that these books are marked down says very little about their quality. Some of my favorite books – an audio version of Richard Russo’s The Straight Man comes to mind – I’ve found here. So while I’m sad to see these books remaindered, I’m also reminded that quality and popularity are not always linked. This heartens me in case I do write and market really well only to see my book end up here. So I’ll be sure to report back on what I score . . . I will be sure to come away with at least one great title and a lot of inspiration. What do you think about bargain books? 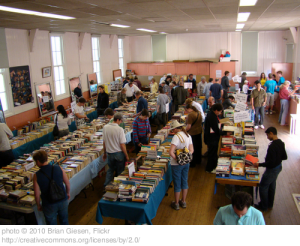 What do you think about book fairs? Where do you find your favorite book purchases? Where do you hope to see your books for sale?